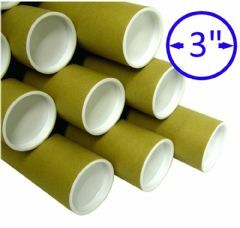 High quality strong durable postal tubes supplies with white plastic end-caps. Our postal tubes are ideal packaging for transporting and protecting documents, photos, posters or long items during transit or in storage. The tubes are available in 2" (50mm) and 3"(75mm) diameter on a range of lengths from A3/4 size (330mm) up to A0 size (890mm) and have a 2mm wall thickness. Our tubes are recyclable and biodegradable and are supplied with end caps as standard but if you are cutting down postal tubes to smaller sizes or reusing tubes you can buy our spare end caps to give a professional finish.